Happy Friday! 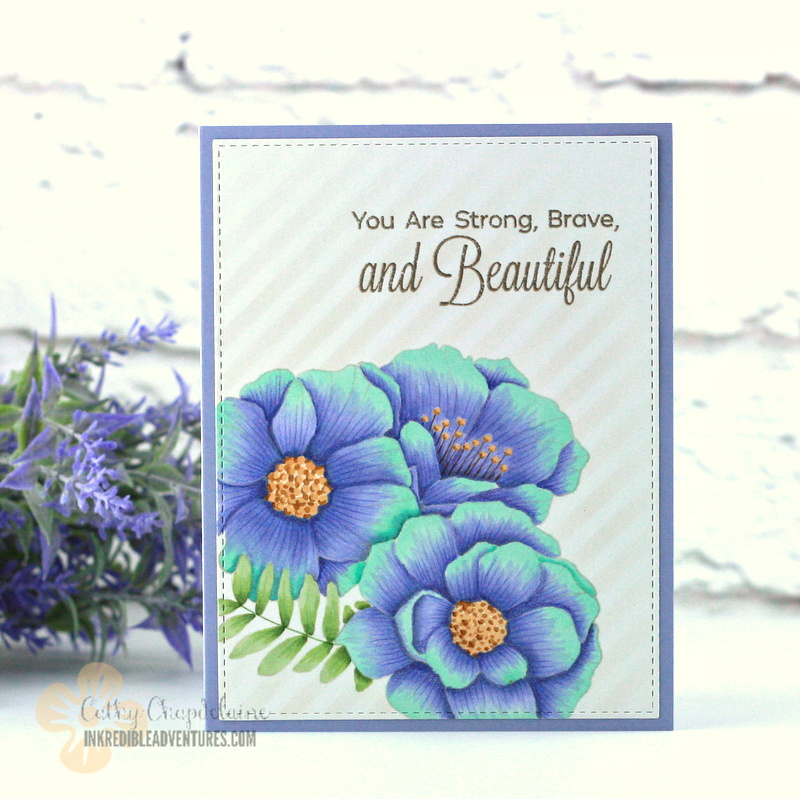 Sharing another card today inspired by the current MFT color challenge. I love this color combo! I’ve used all MFT on this one. I started by Copic airbrushing the confetti stencil with BV13 towards the top and BV02 towards the bottom of the panel. To add a little shine, I left the stencil in place and pressed a Versamark ink pad over the top. I then heat embossed with UTEE. I die-cut the Tag Builder Blueprints 7 dies from white cardstock and inked them with Distress inks in Shaded Lilac and Peacock Feathers and spritzed a little water on them. I heat embossed the sentiment in detail white. 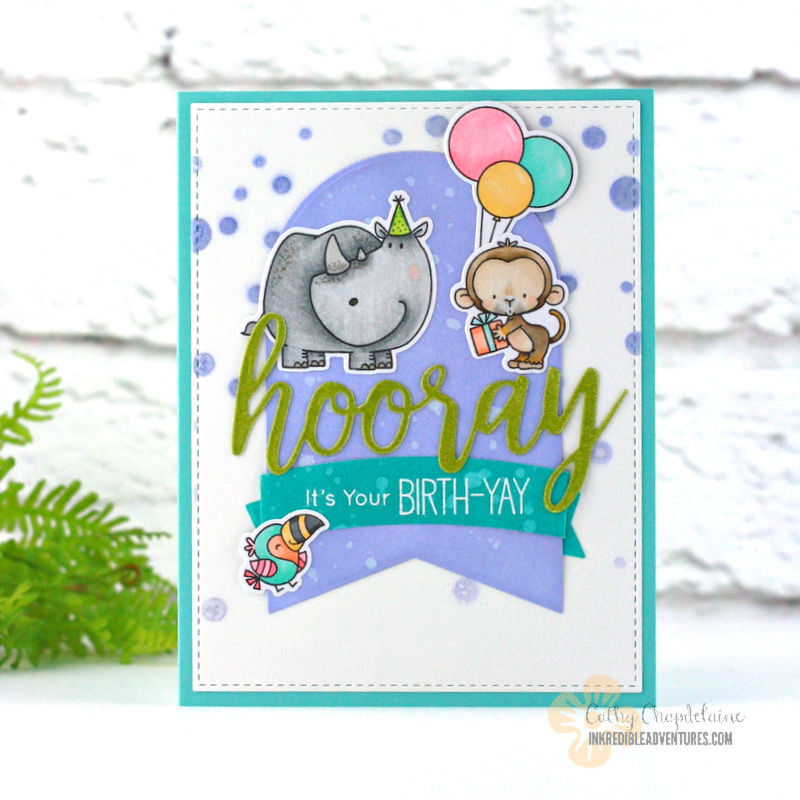 I colored the animals from the Happy Birth-Yay stamps and the balloons from the Happy Hippos stamps with Copics. That monkey makes me laugh. He looks a little sassy! To finish it off, I die-cut the hooray die-namics from white cardstock and heat embossed a few times with a lime green Recollections embossing powder. I’m giving this card to my granddaughter who’s celebrating her birthday today and we’re taking her to the zoo tomorrow. Thought it was pretty fitting. Hope you have a great weekend and thanks for stopping by! Happy Saturday! 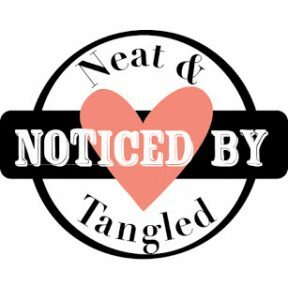 I’m playing along with the MFT Sketch Challenge #426 this week and finding out that I really love participating in sketch challenges. They’re such a great jumping off point. 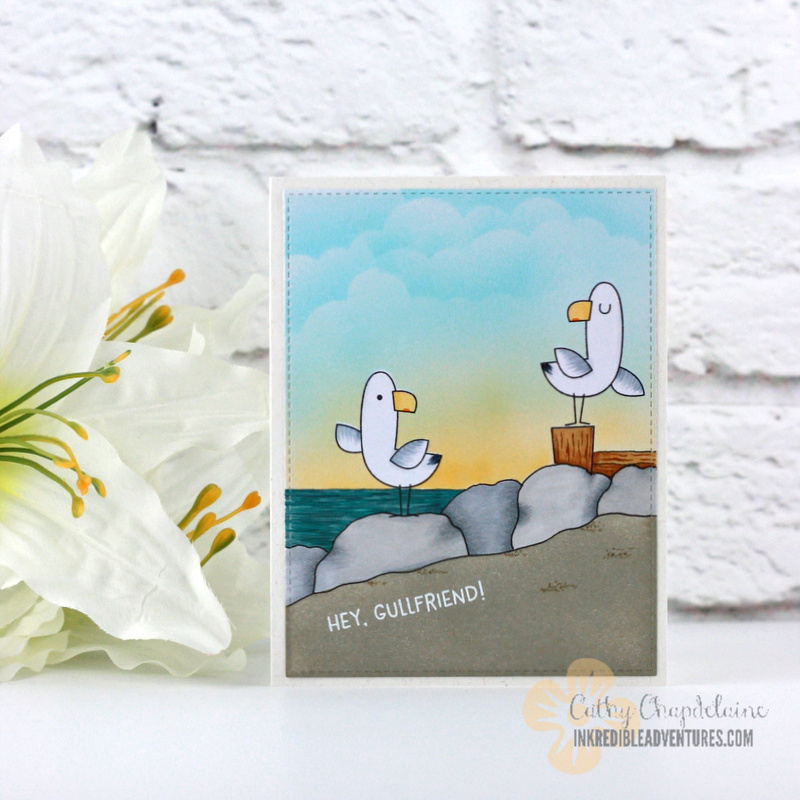 I’m still dreaming of summer, so I thought of doing a little seashore scene with the Seaside Seagulls stamps. I started by drawing the rocks with a Copic multi-liner and then I stamped the bird on the left. I masked the rocks, bird and horizon line using eclipse tape. An easy way to mask hand drawn elements is to place the tape over the top and trace the outline onto the tape. Then, fussy cut the tape with scissors and you’re all set. 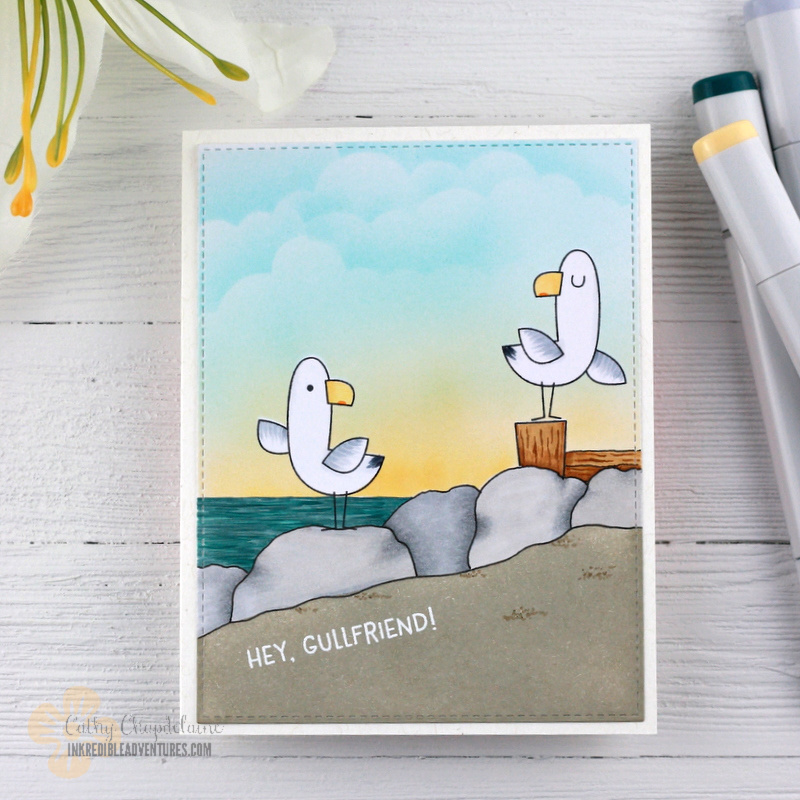 I then stamped the bird on the right and drew a little more wooden pier. I masked them too and then airbrushed the sky with Copics and the MFT mini clouds stencil. Leaving the rocks masked, I inked the sand area with Pumice Stone distress ink and then heat embossed the sentiment with Wow! detail white embossing powder. I colored the seagulls and the rest of the elements with Copics. Hope you’re having a great weekend and thanks for stopping by! 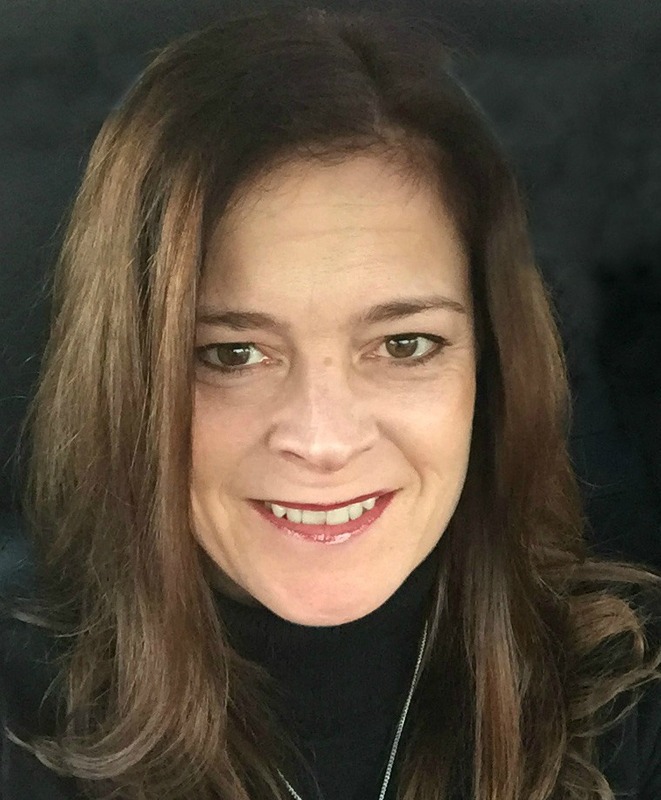 Hi again! 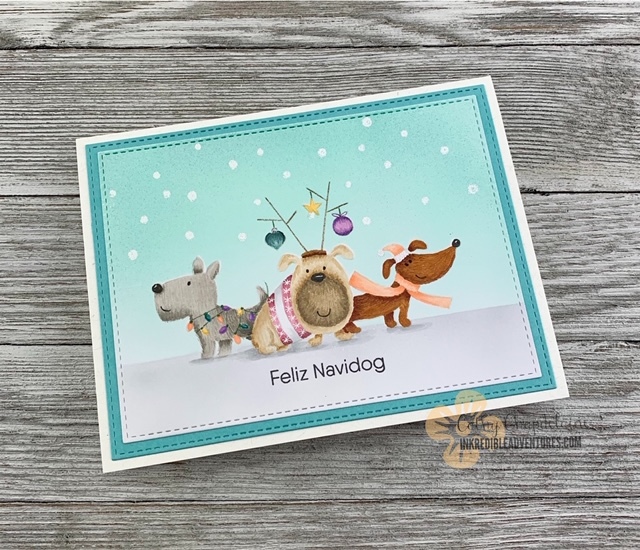 I’m still scrambling to get a few more Christmas cards finished this week and I’m so happy I had a chance to work with these cute dogs from the MFT Deck the Howls stamp set. Super simple design on this as I wanted the doggies to take center stage. I started by stamping the dogs in MFT Cement Gray hybrid ink and masking them before Copic airbrushing the background with BG10, BG11 and BG 18. I taped off a straight line right above the dogs’ feet and airbrushed the bottom with N2, N1, and N0. 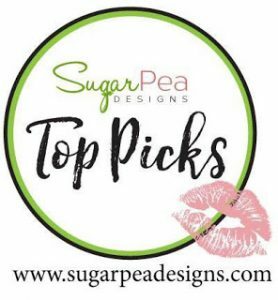 I placed the MFT Snowfall stencil towards the top of the cardstock and inked through each hole in the stencil with an embossing pen. I then heat embossed with Wow! detail white embossing powder. I colored the dogs with Copics and added colored pencil details. I saw a great tutorial by Irina Blount (owner of LaLaLandCrafts) where she used a white gelly roll pen to add detail to a sweater, so I had to give it a try on this. Super easy and really cute! 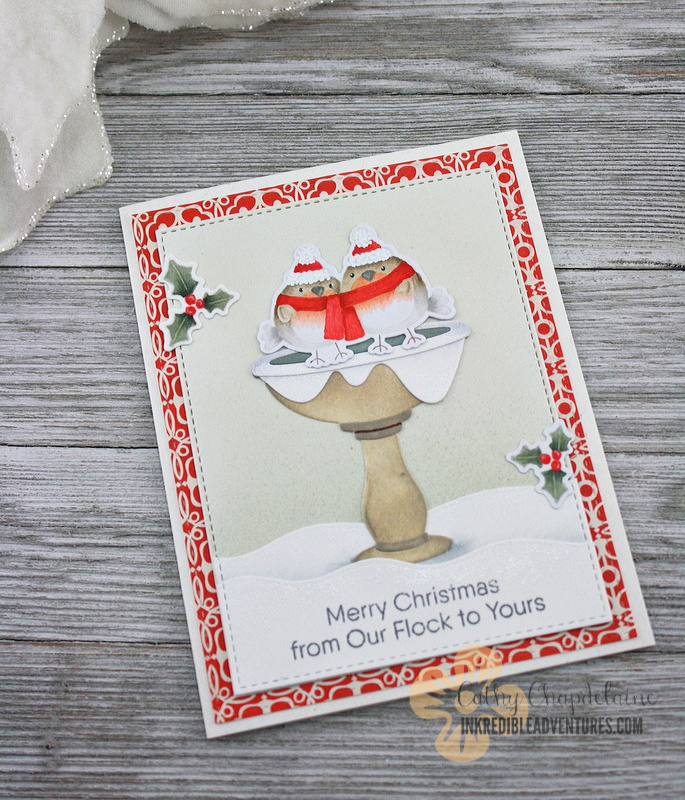 Hope you enjoyed and I’ll be back again in a few days with one last Christmas card for Gerda Steiner Designs. Hi there! 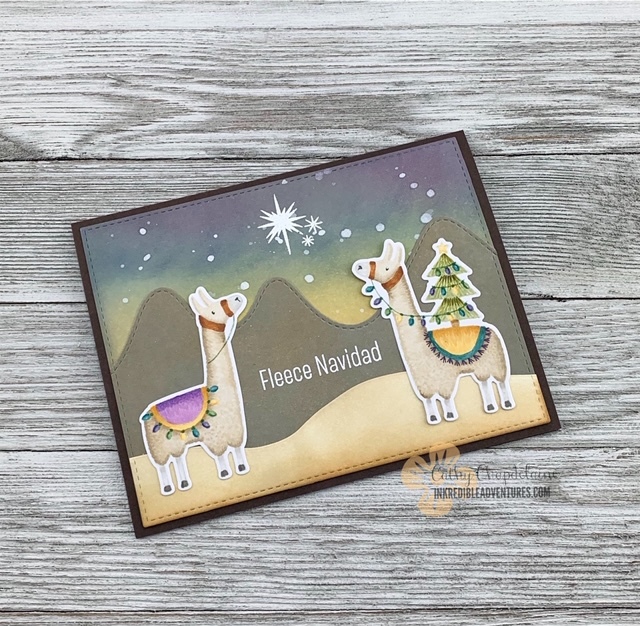 I’ve got a few more Christmas cards to share this week and these llamas were so much fun to work with! They’re from the MFT Happy Llamadays stamp set and they’re decorated and ready for Christmas. I just love this sentiment. Too cute! I started by inking the background using Dusty Concord, Chipped Sapphire, Tumbled Glass and Squeezed Lemonade Distress inks. After I blended these colors, I went over the top of all of them with Old Paper distress ink to tone it down a bit. I splattered a little watered down gouache and then heat embossed the star in white embossing powder (that stamp is from an older CTMH stamp set). Then, I die-cut a piece of white cardstock using the MFT Stitched Rectangle Stax die and die-cut the piece twice using the MFT Stitched Mountain Range die and the MFT Surf and Turf die. I inked the mountain range using Frayed Burlap and Hickory Smoke distress inks and for the ground, I used Old Paper and Vintage Photo. 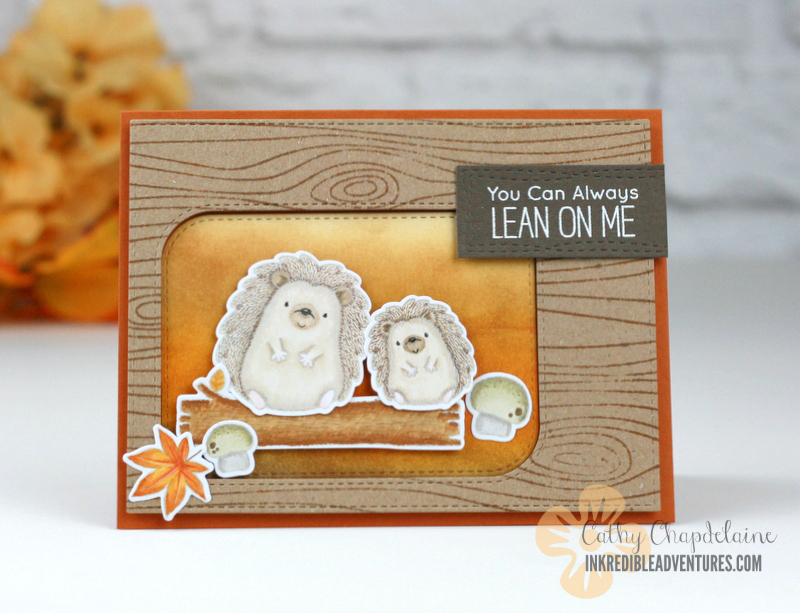 I heat embossed the sentiment from this set using white embossing powder. I stamped the llamas using MFT Cement Gray hybrid ink and colored them with Copics and colored pencil for some of the details. 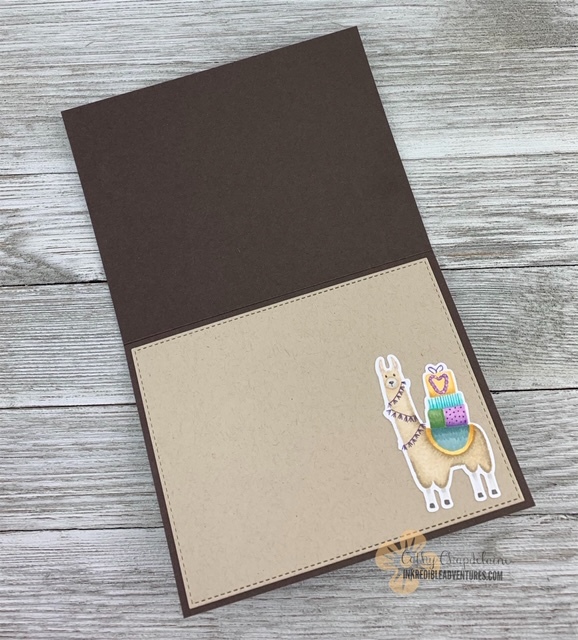 Since I chose a dark brown cardstock for the card base, I die-cut a piece of Neenah Desert Storm for an insert and added another cute llama inside. Hope you enjoyed my card today and thanks for stopping by! Hi there! Can you tell I really really want to be somewhere warmer right now? Making a tropical Christmas card is about as close as I can get. 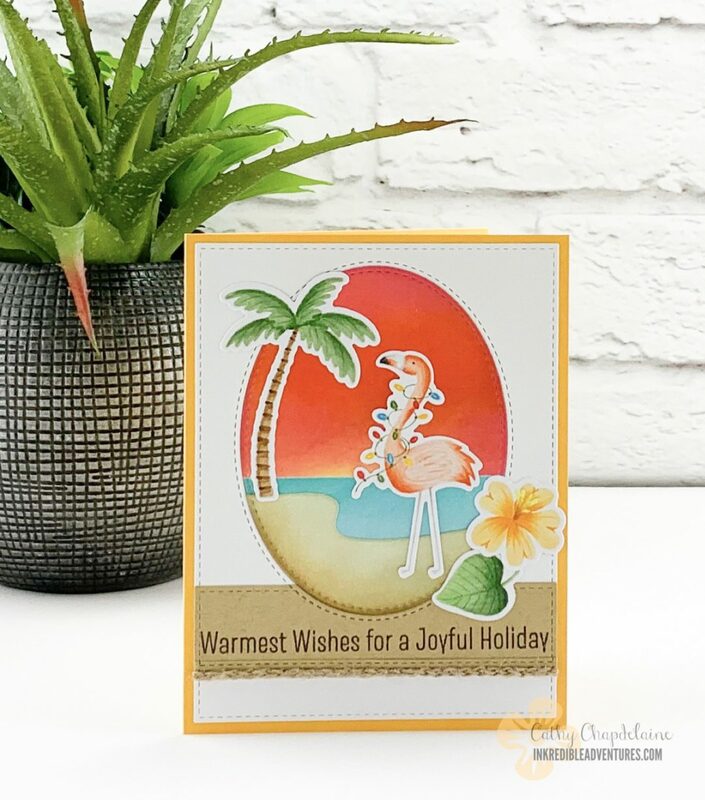 I’ve used the MFT Festive Flamingos stamp set with some stamps from the retired MFT Tiki Party stamp set to create my tropical getaway. For the background, I blended distress inks in Squeezed Lemonade, Fossilized Amber, Worn Lipstick and Abandoned Coral. The water is Tumbled Glass and Salty Ocean and the sand is Old Paper and Vintage Photo. I used the MFT Beach Scene die-namics to cut the sand and the whole scene was die-cut using the MFT Inside and Out Stitched Oval Stax die-namics. I’ve colored all of the images with Copics and added some colored pencil details. For the background piece, I die-cut a piece of Neenah solar white cardstock using an MFT Stitched Rectangle Stax die and airbrushed a soft green background with Copics (BG90, BG93). I then die-cut another piece of Neenah with the Rectangle Stax die and die-cut this piece twice using the MFT Surf and Turf dies for the snowdrifts. 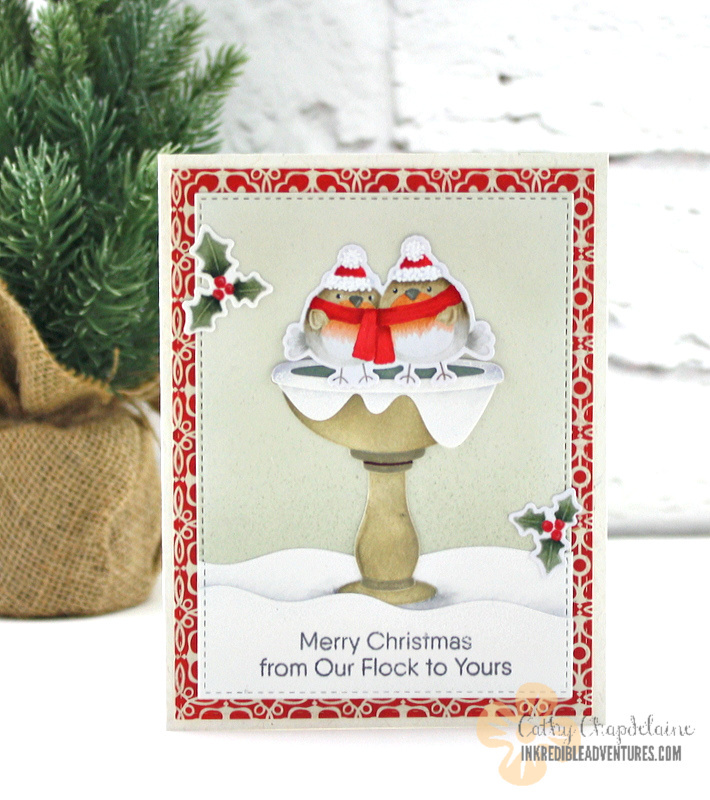 I heat embossed the top edges of the snowdrifts with white embossing powder, stamped the sentiment in Memento Gray flannel ink and added some shadows with Copics before layering them on the bottom edge of the background piece. I inked the birdbath using Old Paper and Pumice Stone Distress inks and Iced Spruce for the water. The snow on the birdbath is where it got a little crazy. I noticed that the new MFT Mountain High die-namics fit perfectly along the rim of the birdbath and looked like snow hanging off! Love it when I can get double-duty out of a die! I heat embossed the snow on the birdbath also with white embossing powder along the edges. Then, I colored up the birds and holly using the no-line coloring technique and cut them out with the coordinating dies. To finish the card, I die-cut a piece of patterned paper from my stash with the largest Stitched Rectangle Stax die and added some more shadows with N Copics to the snow on top of the birdbath and the snow around the bottom. I really love how this turned out and I hope you enjoyed it! 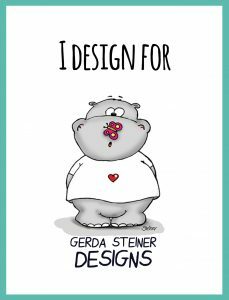 Be back soon with a new card featuring a brand new release from Gerda Steiner Designs! Hi there! 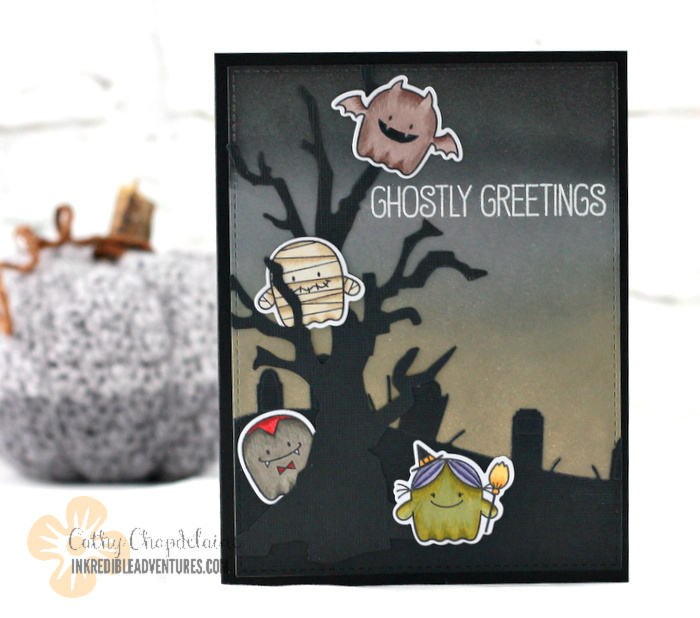 I’ve got one more Halloween card to share using the Fab-BOO-lous Friends stamp set from MFT. I didn’t pick this one up last year, but decided this year I really had to have it. They’re just so cute! I really love how the background turned out on this. I was going for a spooky dusky look, so I inked a piece of die-cut cardstock with Pumice Stone, Hickory Smoke and Black Soot Distress inks. I die-cut a piece of black cardstock using the same MFT Stitched Rectangle die-namics and then die-cut the graveyard scene using a Memory Box Graveyard Landscape die. I added a die-cut tree using the Tim Holtz branch tree die to finish my spooky scene and colored up all of the little ghosts with Copics. For the sentiment, I heat embossed using WOW! detail white embossing powder. When I use black cardstock for a card base, I like to add an insert for a handwritten message inside. 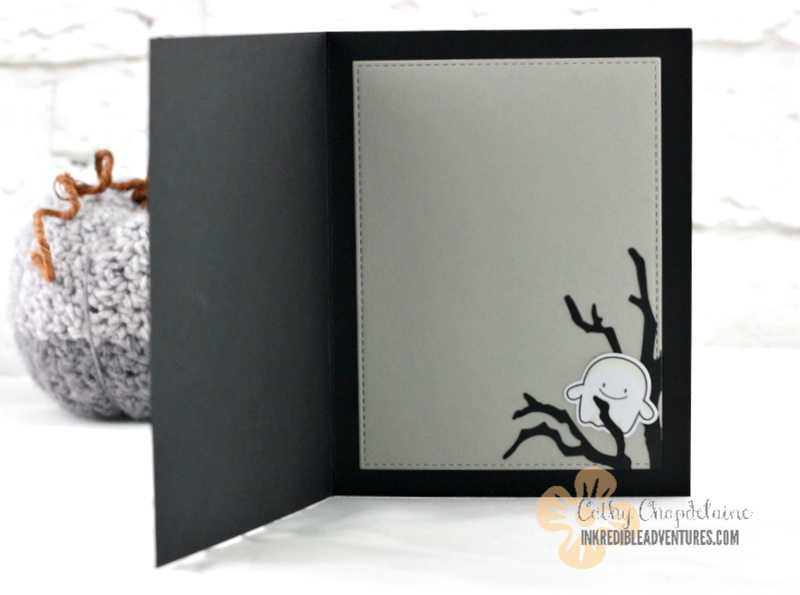 I always like to add a little something extra on the insert, so there’s a partial die-cut tree and another cute ghost. 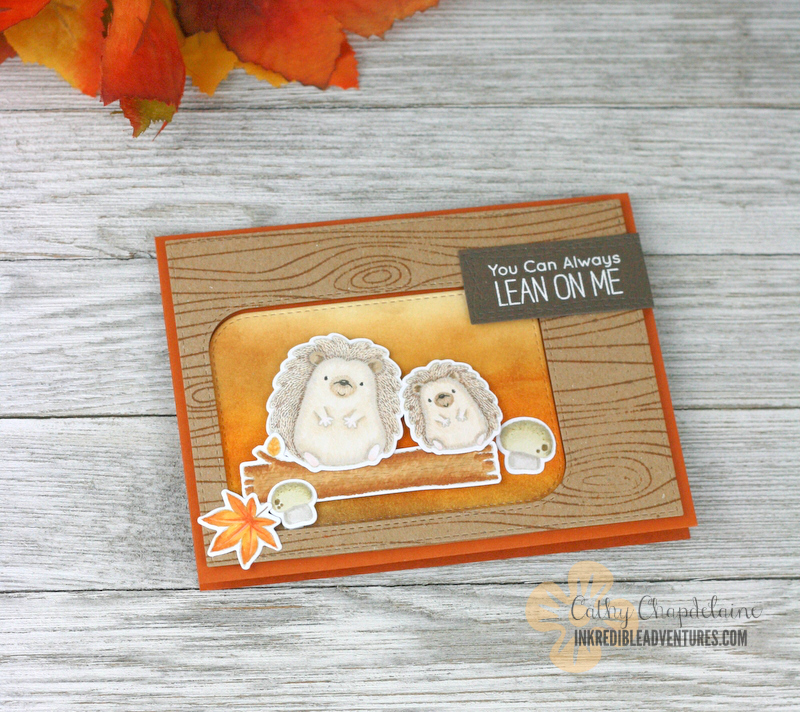 I’ve got a new card today using the adorable MFT Birdie Brown Frightfully Sweet stamps. I don’t really celebrate Halloween much, but I do love making Halloween cards! I started by die-cutting a piece of black cardstock using the MFT Stitched Rectangle Stax die-namics and then I die-cut the piece with 3 different sizes of MFT Stitched Mod Square die-namics, one at a time. I adhered the black cardstock to my card base using thin strips of dimensional foam. I like to use sheets of craft foam that you can buy at any craft store and cut it down to size. 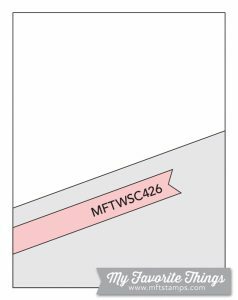 Just a tip–I run a marker along the edges of the craft foam to match whatever color of cardstock I’m adhering down so the foam is nearly invisible when you view the card from the sides. Some tape adhesive on both sides of the craft foam makes it work just like the dimensional adhesive at a fraction of the cost. For the background pieces, I die-cut a piece of cold-press watercolor cardstock using the Stitched Square Mod Stax die-namics again and inked using Dusty Concord, Seedless Preserves and Hickory Smoke Distress Inks. I splattered a little watered down white gouache and once dry, I painted a thin layer of Daniel Smith pearlescent shimmer watercolor paint. The shimmer isn’t visible in these photos, but it added a neat effect. For the sentiment, I die-cut black cardstock using a PaperTreyInk label die and matted it on a green patterned paper. (I fussy cut around the edges to get that mat as the die only comes in one size). 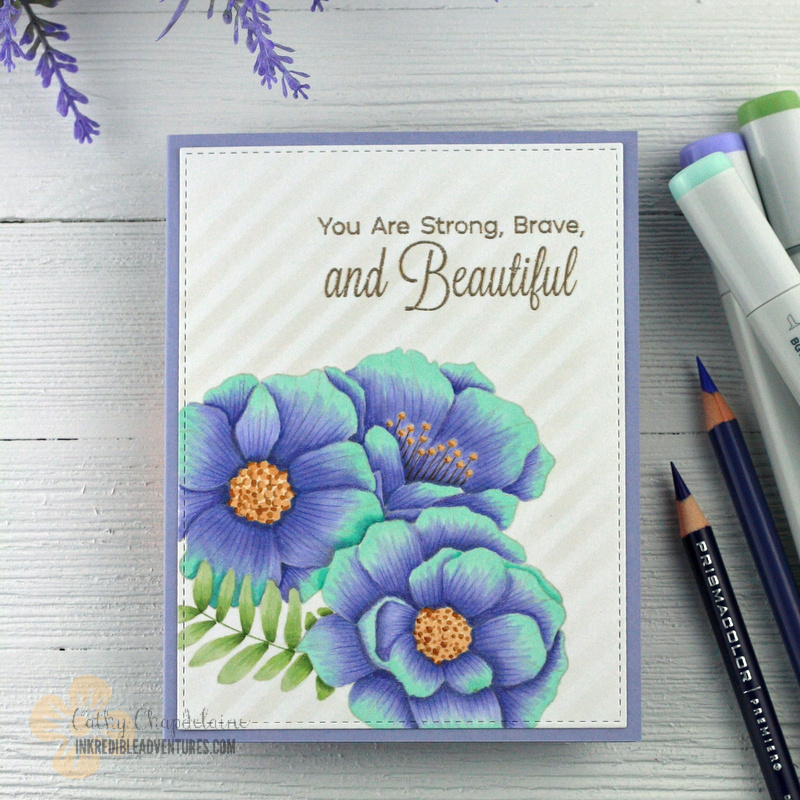 I heat embossed the sentiment from this set using WOW! detail white embossing powder. 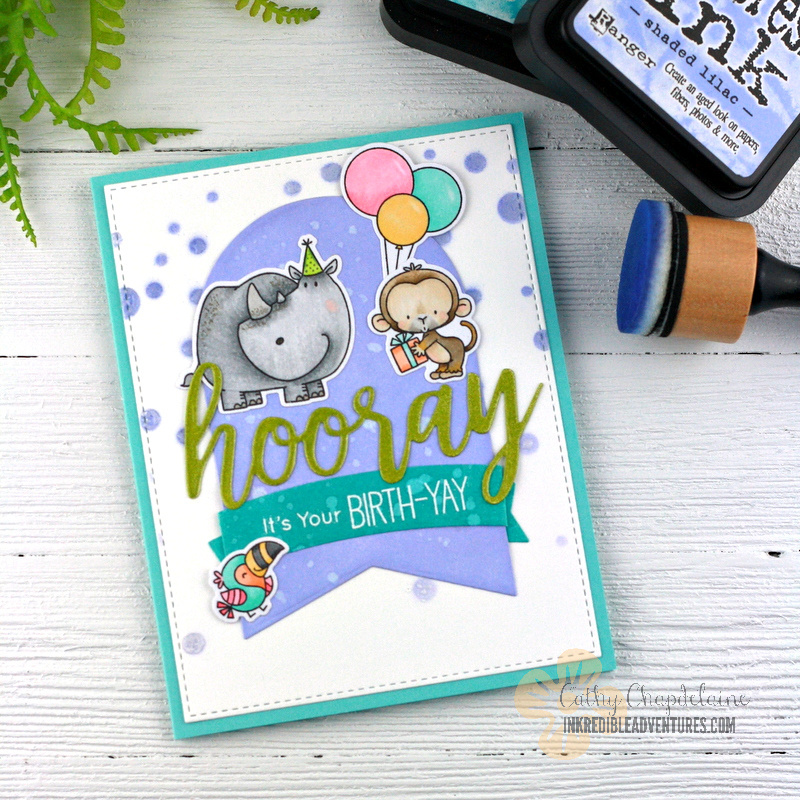 I stamped the images in MFT Cement Gray ink and then did some no-line Copic coloring on them. They’re adhered with dimensional adhesive for added interest. This was a lot of fun to make and I hope you enjoyed it!